Why do Tigers Mark their Territory by Peeing on Trees like Dogs and What Does its Urine Smell Like? 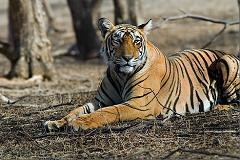 Tigers mark their territory by peeing on trees because they are solitary and very territorial animals. Male tigers are more intolerant of other males inside their territory than females are of other females, and territorial disputes are usually resolved by displays of intimidation, rather than actual fighting. Once dominance has been established, a male may actually tolerate a subordinate tiger, as long as they do not live too close to each other. And yes, humans can smell tiger pee, and it may smell quite familiar. If you’re walking in the jungle, and you suddenly get the sense that you’re approaching a movie theater lobby, beware. According to people in the know, trees marked by tigers smell uncannily like buttered popcorn. Tigers each have a stripe pattern as different and individual as a person’s fingerprints. Orville Redenbacher runs with the big cats. Why Did Samuel Clemens Call Himself Mark Twain and What Does the Name Mark Twain Mean? Why Are White Tigers an Endangered Species and How Many White Tigers Are Left in the Wild? How Difficult is it to Breed Tigers in Captivity and Do Zoos Still Capture Tigers From The Wild?